Sun Yatsen (1866-1925) occupies a unique position in modern Chinese history: he is equally venerated as the founding father of the nation by both the mainland Communist government and its Nationalist rival in Taiwan. The first president of the Republic of China in 1911-12, the peasant-born yet Western-trained Dr Sun was also a dedicated political theorist, constantly in search of the ideal political and constitutional blueprint to underpin his incomplete revolution. A decade before the public emergence in Japan of his ‘Three Principles of the People’, and weeks before even his first slim publication in 1897, Kidnapped in London, Sun was already hard at work in the Reading Room of the British Museum, planning his most ambitious book yet: a comprehensive political treatise in English on the tyrannical misgovernment of the Chinese nation by the Manchus of the Qing Dynasty. Started then abandoned twice over, destined never to be completed, let alone published, we can only conjecture what title this revolutionary book might have had. 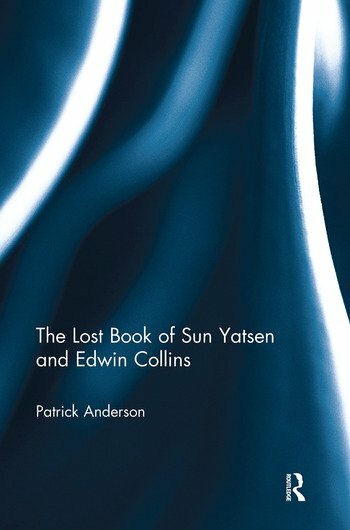 The Lost Book of Sun Yatsen and Edwin Collins　is the first study of this lost work in all scholarship, Western or Chinese. It draws its originality and its themes from three primary sources, all presented here for the first time. The first is a series of interconnected lost writings co-authored by Sun Yatsen between 1896 and 1898. The second is the mass of lost political interviews with, and articles dedicated to, Sun Yatsen and his politics, first published in the British press in the aftermath the dramatic world-famous rescue of Sun from inside the Chinese Legation in London in 1896. The third source is the ‘Apostle of the Simple Life for Children’, the Anglo-Jewish Rabbi Edwin Collins (1858-1936), a devotee and practitioner of Jean-Jacques Rousseau’s Émile and the New Education movement it inspired, who became Sun’s writing collaborator of choice during his years of political exile from China. Drawing on this wealth of neglected material, Patrick Anderson’s book offers a genuinely fresh perspective on Sun Yatsen and his political motivations and beliefs. Chapter Two: ‘The Canton Conspiracy’. Chapter Three: A Published Author. Chapter Four: In Search of the Rabbi Edwin Collins, 1858-1936. Chapter Five: Edwin Collins and the Writer’s Life. Chapter Six: The ‘Apostle of the Simple Life for Children’: Edwin Collins and the New Education. Chapter Seven: Sun Yatsen and the Collins Household. Chapter Eight: Revolution from Below, Not Reform from Above: Writings Found, 1897-8. Chapter Nine: Writings Lost: Sun Yatsen and Edwin Collins, 1899-1914. Chapter Ten: Sun Yatsen and Chinese Education Reform. Appendix 1: "China’s Present and Future: The Reform Party’s Plea for British Benevolent Neutrality", 1 March 1897. Appendix 2: "Chinese Children: How They Are Reared. Special Interview with Dr. Sun Yat Sen", 1 April 1897. Appendix 3: "Judicial Reform in China", 8 July 1897. Appendix 4: "Chinese Army and Volunteers", 18 July 1898. Appendix 5: "The Chinese Rebellion: New China Party’s Aims", 22 July 1898. Appendix 6: "The Movement for Reform in China", 23 July 1898. Appendix 7: ‘The Canton Conspiracy’, Late 1895-Late 1896? Appendix 8: "The Politics of Sun Yat Sen", 26 October 1896. Appendix 9: "Sun Yat Sen at the Savage Club", 17 November 1896. Appendix 10: "Concerning Sun Yat Sen", 1 December 1896. Appendix 11: Two Newspaper Interviews, 10 January 1905. Appendix 12: Beckenham Public Hall Lecture, 9 March 1905. Appendix 13: ‘One Who Knows Him’ (Anon. ), "Dr Sun Yat Sen", 17 October 1911. Appendix 14: A Re-Investigation of Sun Yatsen’s Fifth Arrival in England, Late 1911. Appendix 15: Secret Correspondence from the Chinese Legation, October 1896. Originally from Grampound in Cornwall, Patrick Anderson has studied, lived and worked in London for most of his adult life. A graduate of the Warburg Institute, in the 1990s he worked in mainland China as a Visiting Professor in Beijing and Guangzhou, teaching Western Civilisation. He is resident in Marylebone and is Assistant Registrar of London South Bank University. Patrick believes that ‘All Mankind is One’, and spends all day on Sundays writing epic historical dramas to prove it. This is his first publication.